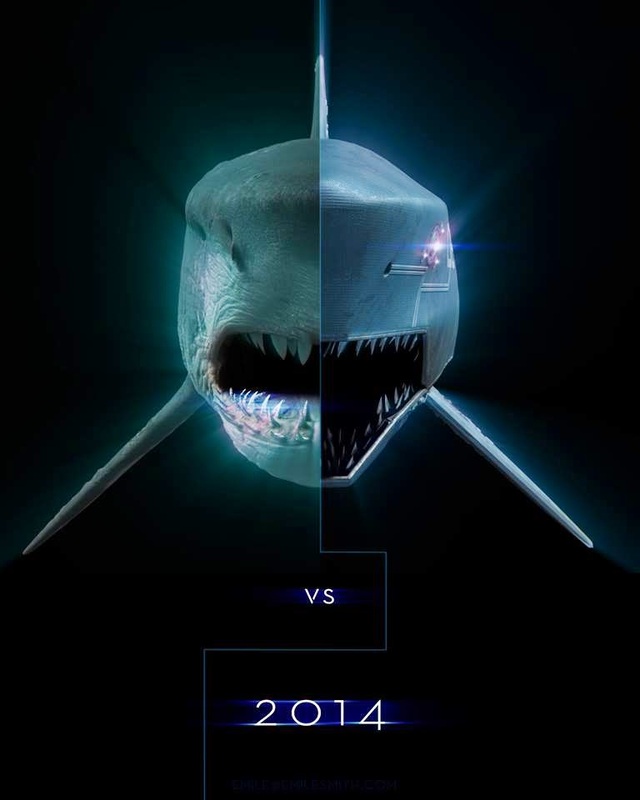 Mega Shark vs. Mecha Shark (2014) is a low budget, straight-to-video monster movie from the wonderful folks over at The Asylum Studios, and as such I obviously couldn't keep my hands off it. It's actually the third film in The Asylum's "Mega Shark vs." series, and after fighting Giant Octopus and something called Crocosaurus it's time for him to take on a man-made creation in his own image: Mecha Shark (basically a shark-shaped submarine). The movie is silly and dumb and a whole lot of fun if you go into it with the right attitude, but for me it's not quite as interesting as the studio's mockbusters. I decided to finally try one of The Asylum's "original" (non-copycat) features because after falling in love with their more derivative releases I thought I owed it to myself to check them out. While this is perhaps the best I've seen of their films in terms of its overall craftsmanship—the CGI was acceptable in places, the acting was only occasionally cringe-worthy, the plot sort of had a natural progression to it—it lacked the interesting relationship to science fiction that their mockbusters have. Instead of participating in the rich genre traditions to which it owes its existence, the best Mega Shark vs. Mecha Shark has to offer is the joke of its premise. This is a movie about being a ridiculous movie, and it's so unapologetic in its silliness that there are indeed fight scenes between a Mega Shark and a Mecha Shark. There's a point at which the Mecha Shark finds itself stuck on land a promptly sprouts tank treads and continues on its way. The movie's central point of enjoyment is that it exists, and while its vain narcissism is oddly admirable it also leaves something to be desired. Two points of praise. (1) The comedy actually works occasionally, and there were a few moments where I found myself laughing with the movie rather than at it. (2) The movie wears its cinematic influences on its sleeve, and ends on a one-minute twenty-second rotating tracking shot that Bad Boys-era Michael Bay would have admired. If you liked Sharknado this is basically more of the same: it's well made by The Asylum's standards (which is to say it's still rushed and sloppy but not a total failure), but doesn't break any new ground.